and called his pediatrician for an appointment right away. The doctor said that they were bug bites. that the rash had nothing to do with the vaccine. I picked up calamine lotion and carpet insect killer. sprayed his carpet with the insect killer and even got rid of our dog. December 2nd Brayden was once covered in bumps. They were mostly on his back/neck and stomach. I freaked out thinking that it was a bug again even though he sleeps in footie pjs. Once again I sprayed the carpets, stripped his bedding and bleached his mattress. I searched HIGH and LOW looking for any bug(s) or even a spider web. The bumps dried up and went away but not for long. By December 22nd Brayden was covered in bumps. arms, legs, feet, hands and face. Some where between 50-75 bumps. I called the Doctor once again and made an appointment. We were seen by a different doctor but once again got the same answer. 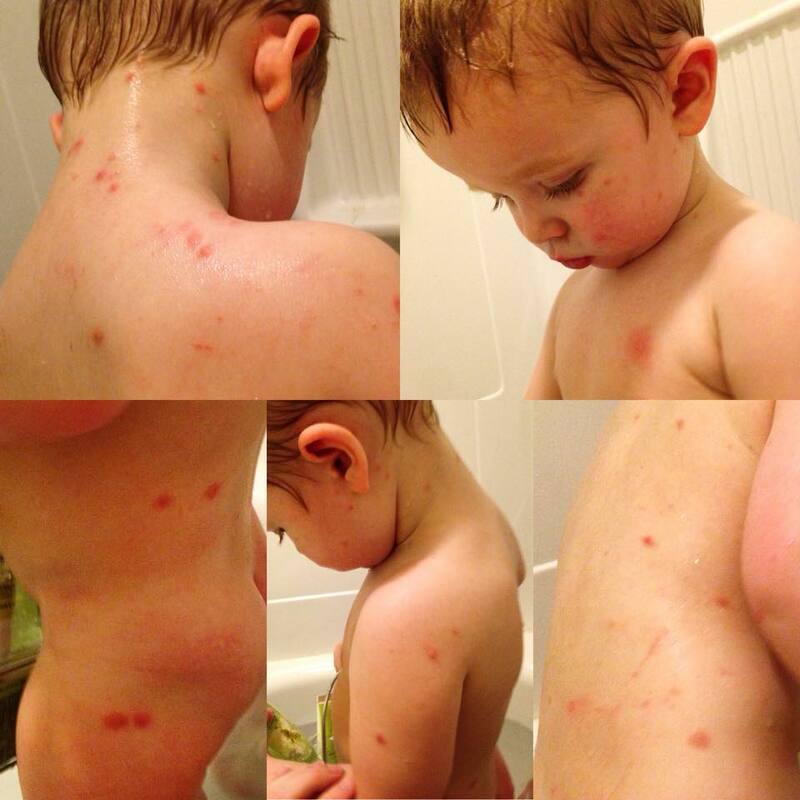 "It looks like bug bites and has nothing to do with the vaccine"
even though non of our issues started until AFTER the vaccine. We have lived in our townhouse for almost a year and magically "got bugs"
even more magically they ONLY bite Brayden. but he thought other wise. So back to step one and repeat. Spray, bleach, strip the bedding and look for bugs. On December 27th Brayden woke up with a fever of 104. His whole body was steaming hot and he also had more spots. I would get his fever down to 101 but every time the medicine wore off it shot back up to 104. Petrified of Febrile Seizures because I had them when I was his age I took him to local ER. I made the mistake of telling them the diagnosis that the first two doctors made. They took his fever, gave him some tylenol and told us it was BED BUGS. The female doctor googled bed bug bites and assured us that was the issue. Once again all questions about the chicken pox vaccine were shot down. 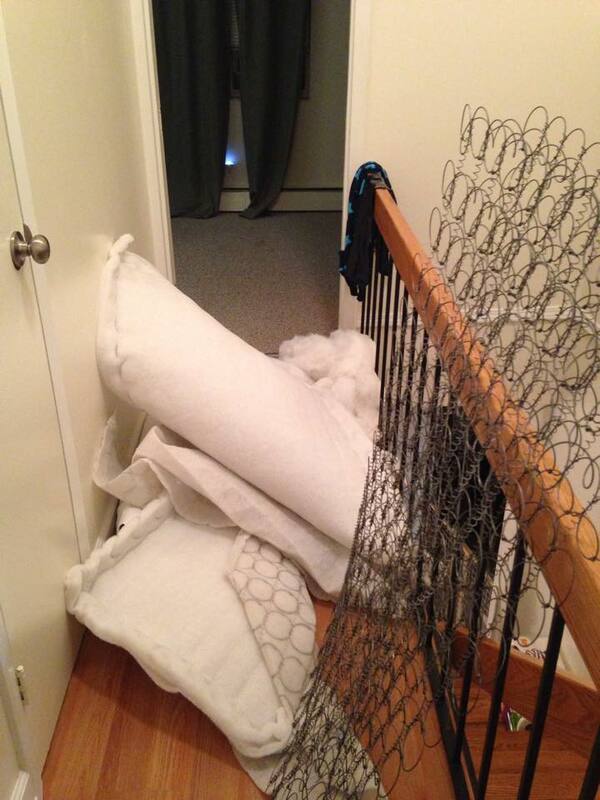 We went home and the first thing I did was cut his mattress in half. Not even 2 years old and bought brand new. I tore through the layers and examined the cotton for ANYTHING. A bug, a shedding, droppling ANYTHING. It was all clean there was not a bug or any signs of bugs in his whole mattress. While I was at it I also cut open his pillow and still NOTHING. To be on the safe side we decided Brayden would sleep in our bed with us and our 9 month old daughter. Surprise surprise even after two nights of not being in his crib he was waking up with new bumps. THOSE DAMN MAGIC BUGS WEREN'T BITING ANYONE BUT HIM. and was so sick all he did was sleep and lay on the couch. Once again off to a DIFFERENT ER we went. This time I decided I was going to play dumb. I wouldn't say anything about the vaccine or bug bites. RASH. FEVER. LOSS OF ENERGY. his rash could possibly be a reaction from the vaccine. They tested for strep, RSV and Influenza. All tests came back negative. "Unidentified rash, follow up appointment in a week and return if fever goes above 102." At this point I was LIVID. So now we officially had 4 different doctors and ZERO ANSWERS. And to top the cake Brayden got a chest cold from being around sick people in the ER for 4 hours. He then passed this chest cold along to his baby sister. On a mission I began to google and research. To my surprise, guess who finally answered my questions? 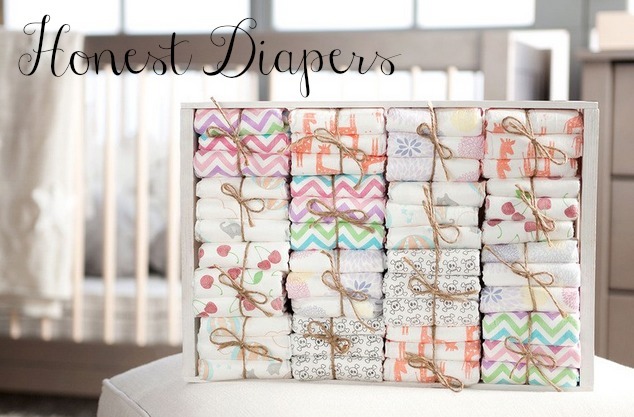 Here is what I found and decided that other moms should be more aware of. Like typical rashes it is worse when he takes a warm bath or wakes up because he's hot. What Brayden has is known as BREAKTHROUGH CHICKEN POX in civilian terms. 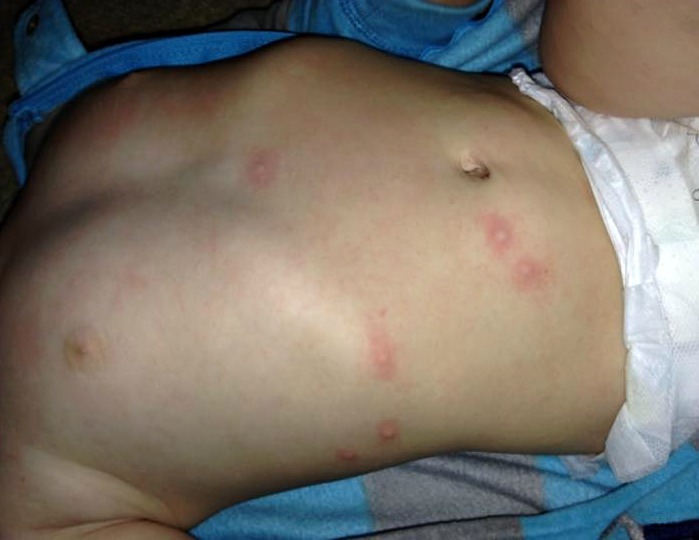 Breakthrough varicella on the abdomen of a vaccinated child. Breakthrough varicella is infection with wild-type VZV occurring in a vaccinated person more than 42 days after varicella vaccination. Breakthrough varicella is usually mild. Patients typically are afebrile or have low fever and develop fewer than 50 skin lesions. They usually have a shorter illness compared to unvaccinated people who get varicella. The rash is more likely to be predominantly maculopapular rather than vesicular. However, 25%-30% of persons vaccinated with 1 dose with breakthrough varicella have clinical features typical of varicella in unvaccinated people. Since the clinical features of breakthrough varicella are often mild, it can be difficult to make a diagnosis on clinical presentation alone. Laboratory testing is increasingly important for confirming varicella and appropriately managing cases and their contacts. There is limited information about breakthrough varicella in persons who have received two doses of varicella vaccine, though it appears to occur less frequently among people vaccinated with two doses of varicella vaccine compared to persons who have received a single dose of varicella vaccine. 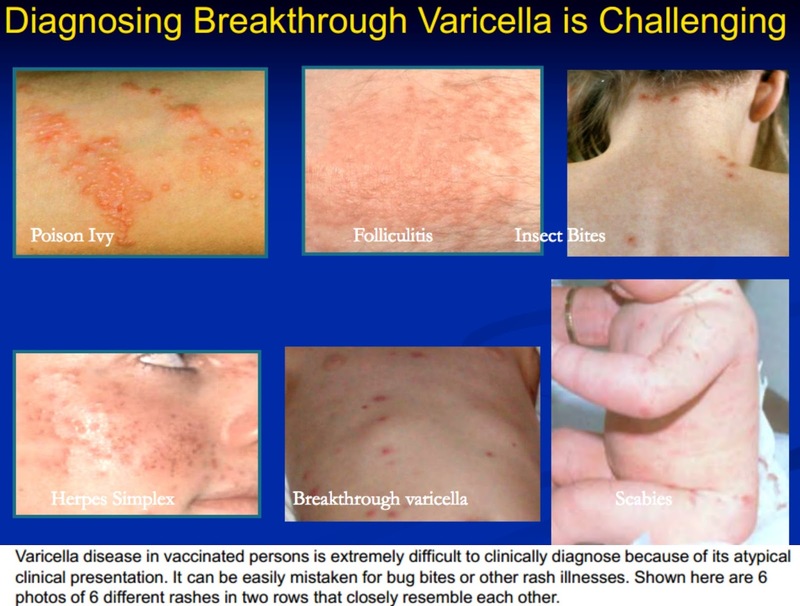 Breakthrough Varicella means chicken pox in a vaccinated person. It is often mistaken for bug bites or other rashes because it doesn't look like normal chicken pox. USUALLY mild compared to normal chicken pox with less symptoms and bumps. Bumps in rash are flat red areas such as bug bites rather then raised and blistered like normal chicken pox. 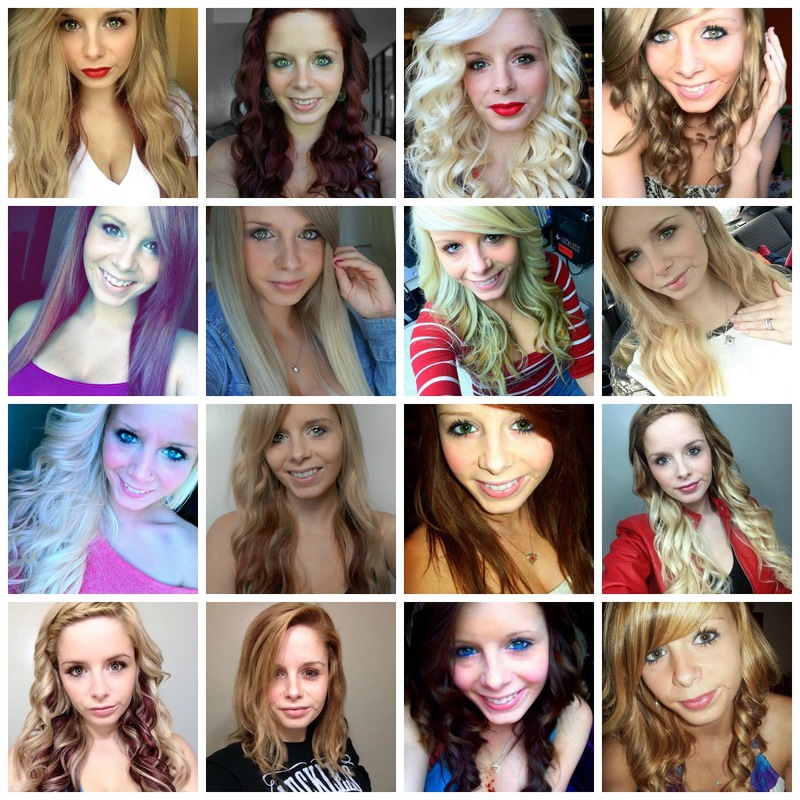 I posted a few links above if you wanted to read more about it. Do I regret Brayden getting the vaccine? No, I am relieved that it isn't as painful as normal chicken pox I just wish doctors would have answered us and didn't give us the run around for weeks. We don't have the chicken pox vaccine here in the UK, its just a normal childhood illness to us. My little lady hasn't had it yet though! Hope Braydon gets better soon! That's how it should be here but instead for some reason we are vaccinating against it instead of allowing it to just happen. Thats so strange, me and my sister were vacinated and we got the chicken pox. But they never went away and came back. Once we had them we had them for about 2 weeks. They started off as tiny blisters and than got bigger and itchy. I've never gotten the chicken pox and my doctor told me to get the vaccine after i gave birth. It's been 6 months but i haven't gotten it. I'm wondering if this will happen to me and i don't want to since my 6 month old is always with me and sleeps with me. Will you give Elena & Treyson it? I'm not sure I want to give Brantley it..
My son had a few spots after his second chicken pox vaccine. His pediatrician warned us though that he could get some breakthrough spots. I'm glad he mentioned it though, otherwise I would have been freaked out!! I feel so awful that you had to go through that whole ordeal, back and forth between all those doctors! I am glad for the vaccine though, I don't want it to just run it's course like it used to. when I had the chicken pox as a kid I had them so bad it was miserable! I had them on my eyeballs and in my mouth! I would not wish that on anyone!! Can you get it before the 42 days? Thank you so much for this! I am going threw this exact same thing right now with my 3 yr old son. He did have 2 doses and his symptoms are mild, but still very uncomfortable for the little guy. About 3 weeks ago it was a fever that wouldn't go away probably 103.. after a few days it went away, and then the little spots (bites as we thought) started coming. . First just a few on his back.. then his shoulder. . Then legs head.. arms.. even his little face has some. I can now rest, after reading this! I have a 6 year old and she has a body rash from her neck to knees that is similar. My doc said allergic reaction but I thought it was chicken pox from day 1. She doesn't have a fever just itchy and they are scabbing over after about 4 days. Thanks for the post. Thank you for posting this. My 14month old got the varicella vaccine a few weeks ago, and while I expected a few pox to be present: I was not prepared for my already vaccinated 3year old to get a few as well : the viral particles are shed in saliva: they share drinks all the time. These pictures made me realize what was going on.